Well, after many hours of sewing this weekend (not to mention too much time spent crawling around on the floor! ), I’m pleased to say that I manged to get this quilt top (nearly) finished. Many of you wondered what color sashing I was going to use… as you can see, I went with a solid white. I absolutely love how the flea market fancy prints look with bright white! When I started this one, I wasn’t really thinking about what size it would be – I was more interested in just getting this one made — it’s one I had wanted to recreate since using this same design with the Heather Ross Far Far Away II fabrics. After cutting all the squares though, I realized that I could add a few more and have a more significantly sized quilt. I decided to try for a queen sized quilt, though since I didn’t really feel like doing any math, I kind of guessed at the amount needed. Needless to say, upon completing all the sashing, I found that while it does fit the bed right now, it’s a bit smaller than I would like. I suppose it just goes to show that measuring and doing some math can be quite useful! I guess I’ll be adding a bit of extra sashing around the perimeter to get it up to size. Anyway, I’m very happy with how it looks. I love that it uses just simple squares of fabric, but fancies it up a bit by setting them on point. Of course, all that sashing is a bit tedious to sew, but certainly worth it in the end! I’m going to be thrilled to get it quilted and get it on our bed. I’m thinking that this will probably be the last big quilt I make for right now – all that bending over and crawling around on the floor was no fun at 30 weeks pregnant! This entry was posted in Posts about Quilts and tagged denyse schmidt, flea market fancy, handmade, queen sized, quilt, set on point. Bookmark the permalink. How awesome! You’ll be glad you got it done before the baby comes… you’ll be too buys cuddling and staring at your little guy! I’m 32 weeks and working on floor-length lined curtains for the nursery; I just KNEW I couldn’t crawl around on the floor, so I’m “managing” by draping the pieces over my ironing board and pinning them section by section. Still tiring, but so much easier than the dread “getting down” and the horrible “getting back up”. Simple yet lovely. You just can’t go wrong with big squares of FMF, and I totally agree that setting them on point gives it just a touch of fancy. Also, OMG, I was on the floor basting a little baby quilt yesterday and it about did me in at 32 weeks. Whee, 3rd trimester! Absolutely love this. It’s gorgeous. I’m impressed that you are crawling around on the floor at 30 weeks! Can I ask, if you remember, what color your walls are in your bedroom? That’s a gorgeous color! And looks so great as a backdrop to the Flea Market Fancy. Our bedroom color is Rainwashed, by Sherwin Williams. That is beautiful! Love the flea market fancy. I like how the white sashing really pops the colors of the fabric. A great way to display a diverse grouping of prints! I LOVE this quilt! It reminds me of the one I am doing with the vintage squares we found in my MIL’s attic before Christmas! I have enough squares to make several quilts and I put a white border around my squares too…and then sashed them with black..Makes them pop! even more! I hope to get the first one of those quilted in the next couple of weeks. How about half square triangles in your border with the points pointing away from the quilt using the same prints and your white fabric? How are you going to quilt yours? I’ve been trying to come up with a design for a bed quilt. Yours is lovely! I love that you don’t like doing any math because I don’t either! Love the quilt but I’m much more impressed with crawling around on the floor at 30 weeks. I made a tree quilt around that time I was pregnant with my first. I remember thinking it was so weird to sit cross legged on the floor and have my belly touch the floor every time I leaned forward. Congrats on getting so much sewing done before the baby gets here. Every girl needs some FMF for her bed! Beautiful! I’m seventeen weeks right now and wondering how many full size quilts I can eek out before I get too huge. Are you using spray or just pins right now? I’m avoiding spray but I miss it like crazy! I love it! So colorful and fun. The white is perfect. I really must get into quilting. I think it’s gorgeous! Wonderful job. You are very brave to be crawling around on the floor working on the quilt when you are so far along. didn’t sash them, now I wish I had. While I’m writing this I can see some of your previous quilts, they are all so lovely! Love how this turned out! I think the white looks especially fabulous with these FMF prints! So nice to have such a great splash of color this grey time of year. Oh gosh I love this! The colors the variety!! And your right, this does pop with the white! I also like your easy going attitude with the ‘math’. Can’t wait to see what you select for binding. That looks fabulous! I love love love then squares set on point, great job! Lovely! I am looking at my squares of Bliss just sitting here, waiting to made into a quilt. I like the idea of using simple squares like this. Very pretty! Lovely… So bright and cheery! Those blocks really are so, so pretty set on point. Wow, what a quilt to enjoy! The white sashing makes the blocks really POP! It looks fantastic! Well done putting the blocks on point. Makes all the difference. Take good care of yourself and spend some time snuggled under your quilts while you’re growing that boy! very very beautiful – you just know you’ll have lovely dreams with that on the bed … I’m in awe. I’m not even 1 minute pregnant and I get monster tired crawling over the floor to baste … ! congrats on a super quilt. Beautiful quilt! Any chance youd be willing to give a little how to tutorial on this style? How beautiful ! I agree, a simple sashing works best to show off beautiful fabric like this. It is gorgeous ! beautiful quilt. wish i could find some FMF! p.s. if you think crawling around on the floor is hard at 30wks, you should try doing it at 39wks!!! looks good! i’d go with a skinny white border and a wide colorful border to bring it up to size. 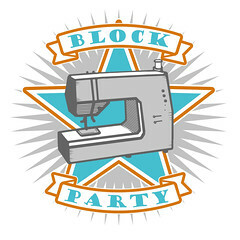 you could even do a patchwork border– squares or rectangles make such cute borders! I like it too! The white sashing is perfect. Bless your heart, I bet it was a challenge crawling around on the floor. Love it!! That is one Awesome quilt!! 30 weeks along!! Woohoo!! You’ll be meetin’ the little fella in no time!! This is simply beautiful, and I’m so jealous of your FMF stash! Yes, definitely get all your sewing in now. I think I didn’t sit down at my machine for a good three months after my daughter was born! Wow, it looks lovely! I love simple squares patchwork, and turning them on point and adding the sashing just allows each print to shine out a little bit more. Oh, how delicious – the colours from that range against the white remind me of Opal Fruits – although I think they’ve now changed their name to Starbursts…or maybe you don’t have either as this could be just an English sweet – either way, it looks wonderful. But crawling around on the floor is the best way to help the baby get in a good position for the birth. Midwives and doulas will recommend lots of hands and knees time to their clients because it’s so helpful for optimal fetal positioning. I know what you mean about crawling around on the floor with a bump – I did that about a month ago trying to get a quilt top and wadding to go together. It was really uncomfortable, and that was for a smaller-than-single sized quilt – you must have had some stamina for a queen sized one! The white sashing is perfect, so crisp and bright. Just beautiful! May I ask? How do you get these projects done so quickly?!? 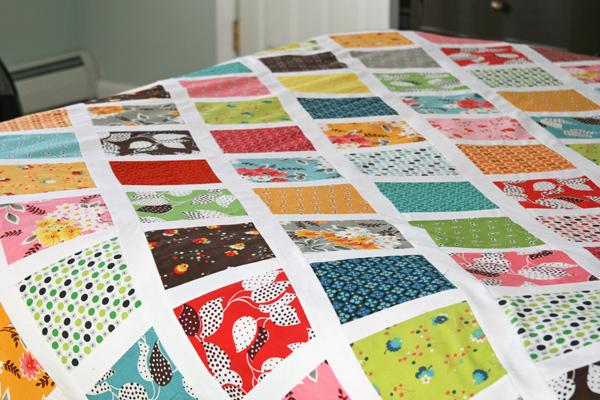 Do you own a long-arm, or what do you quilt your projects with? I just love your work and check your blog daily.. I am always starting new quilt tops and have several ready to be put together but I’m a bit overwhelmed at the thought of finishing them up. This is, once again, a gorgeous quilt you are making!! i think i’m in love!!!!! looks FABULOUS!!!!! This is just stunning – a perfect way to showcase the beautiful fabrics! I’d want to spend all day in bed if I had this quilt on it! 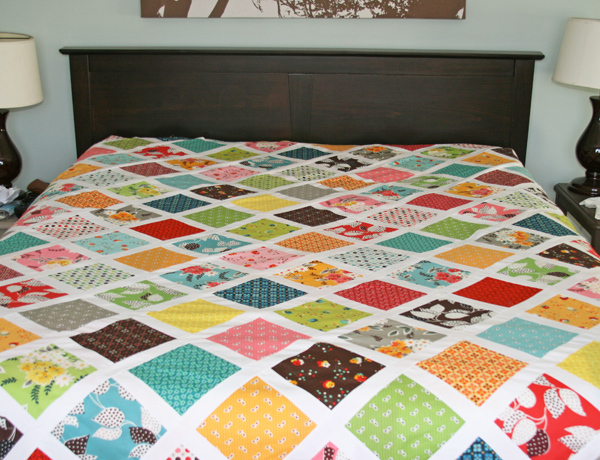 I love the colours you chose for this quilt. It’s really cheery and I like the sashing you did. This is definitely going to inspire my next project! Thanks for sharing. I absolutely love this quilt! 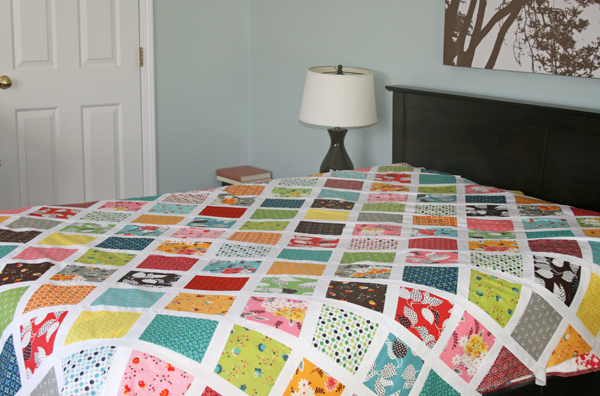 It’s so clean and crisp, something that really attracts me to quilting. Will you be doing a tutorial on this style? I’ve never quilted in my life (although I sew and embroider) but this pattern definitely makes me want to start! 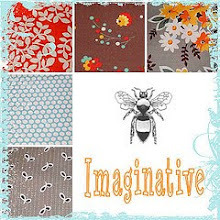 I hate all these new prints because having lived through the 50s and 60s they look so dated to me, but your arrangement reminded me that there is no ugly fabric. You’ve made a fresh, lively, very attractive quilt. To avoid crawling on the floor, get a couple yards of 72 inch wide felt and tack it to a wall. It needs tacks every inch or so along the ceiling and down the sides. Cottons stick, however, without pinning until the pieces get too huge (i.e. when the rows are half complete or more, and then you can use pins to keep the pieces in place). Also, from across the room, you can get a better perspective and take better digital pictures to be sure with a quilt like this one that the colors are spread better. A wall won’t hold a full set of queen size pieces with seam allowance, but you can always trail a few along the floor. White was definitely the right choice, that came out beautifully! I absolutely love this quilt! What size are your squares and how thick is your sashing? Thanks in advance! I’m curious about these dimensions, too.